Rated 2 out of 5 by Nicolas from Great package ruined by a 14A breaker I bought this GP 3250 to power some appliances (fridge, freezer) during storm outage. The package is great, the generator starts every time but the main problem is that I can't power a 1500W portable heater, even when this is the only appliances plugged in. The "culprit", the 14A breaker that keep tripping... I wasted 600 Can $ for nothing that's not what I would call a great customer experience. Rated 4 out of 5 by GB from Very Satisified directions for assembly were very easy to follow. Once assembled it started on the 2nd pull. The only negative I have is the small wheels. It is difficult to maneuver even going up and down small grades with the water hose and sprayer hose at the bottom so close to the ground. 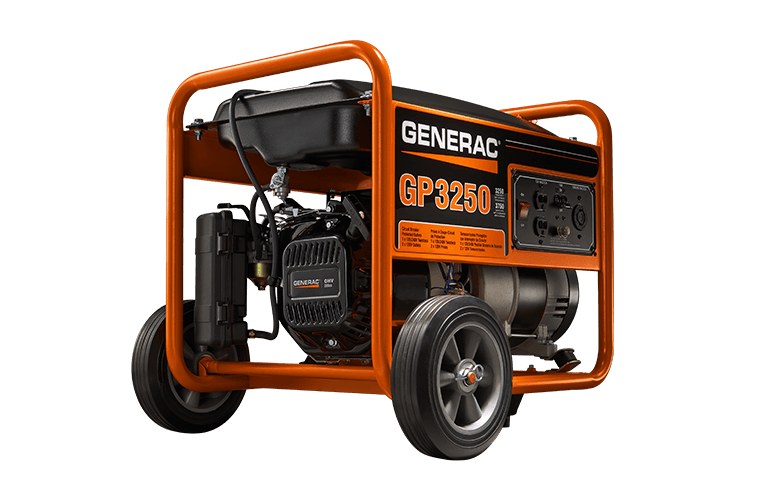 I purchased this portable generator solely because of my purchase of the above power washer. Rated 4 out of 5 by Curtis from Like the features of the GP3300 I purchased a generac GP3300 about a month back for remote power to help set up a mobile home. Have operated the generator quite a bit during the last month and have had no problems to date. It will not support some of my power tools, most specifically a dewalt 12 inch cutoff saw. Requires too much amperage on basic start but it will support most of my smaller power tools. ONE PROBLEM I have is that WAS NO OWNERS MANUAL WITH THIS UNIT. I really would like to have a "written" owners manual for the unit. Is that a possibility. Rated 5 out of 5 by Joe56 from We needed a generator fast We were caught in the recently flooding in WI and our electric service was out and did not have a restoration time from the utility company. We went to the store, purchased the generator and got it set up and running with no problems. Works great. GP3250 is rated 4.6 out of 5 by 188.